Specializing in Hopi Indian Jewelry, Hopi Jewelry, Hopi silver, Hopi silver jewelry, Hopi silver overlay jewelry including Hopi buckles and Hopi Bolo ties. Roy Talahaftewa is pictured here in March of 2012. Roy has moved far beyond the definition of a fine craftsman. His artistic eye, sense of proportion, and balance as well as his style make his work feel right, whether worn in Paris, New York, or Phoenix. Ancient images often appear in Roy's designs, which speak eloquently of the history and culture of the Hopi nation. He often combines the silver overlay technique with tufa casting, uses a variety of metals (gold and silver) and often features beautifully set pieces of coral, lapis, onyx, sugilite, pearl and turquoise. Roy is from the Second Mesa village of Shungopavi, where, watching older silversmiths, he began learning his craft. Selected to attend the Institute of American Arts in Santa Fe, Roy was influenced by the design style of renowned sculptor, Allan Houser. Perfecting his own unique designs since the 1970's, he has become an award-winning Hopi artist, recognized world-wide in his own right. He uses the symbol for the Waterbug encompassed by two concentric circles as his hallmark. For the past few years, Roy has been realizing a personal dream. 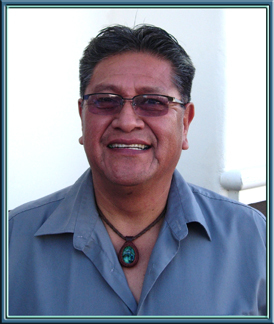 He has been teaching classes and sponsoring workshops to assist Hopi artists and craftspeople improve their skills - not only in their discipline but also in the business world. Roy is truly an artist and a special guy, we are proud to have him as a friend! We would like to introduce you to Andrew R. Talahaftewa, grandson of Roy Talahaftewa. 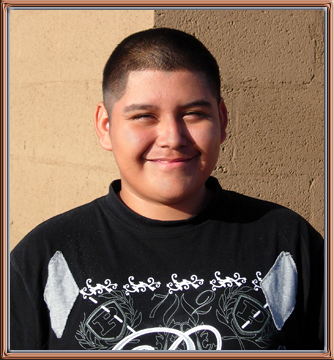 (Shown here at Second Mesa in 2010 when he was 15 years old). 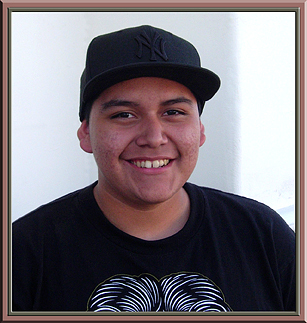 This young man, having spent his Summer's in his grandfather's shop, entered a cast bracelet into the 2010 Hopi Show in Flagstaff, AZ, where he won 1st Place in his age group and sold the piece immediately after the judging. Andrew entered another bracelet in the 2011 Hopi Show and won 2nd Place. Andrew is often found with a sketch book in hand and his very, very proud grandfather nearby. We look forward to watching Andrew refine his talent as he matures. Here is Andrew in March of 2012 at the Heard Museum Show in Phoenix. ©2000 - 2019 Southwest Traditions, all rights reserved; this page or any part thereof may not be duplicated without express written permission of the copyright owner.